The PULSTAR is a 1-MW pool-type nuclear research reactor located on the N.C. State north campus. The PULSTAR reactor uses a fuel that gives it response characteristics that are very similar to commercial light water power reactors. These characteristics allow teaching experiments to measure moderator temperature and power reactivity coefficients including doppler feedback. ABB's Smart Grid Center of Excellence includes functional systems which display the end-to-end solution where information technologies and operational technologies converge to close the loop of automation, control and data acquisition. This tour will explore the future of the power grid, along with associated technologies. 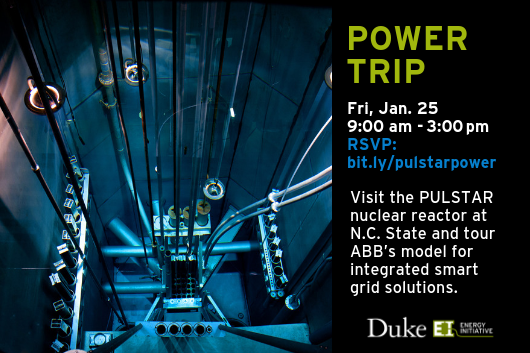 Join us on Friday, Jan. 25 for a day trip to Raleigh (9 a.m. - 3 p.m.) where we'll visit the PULSTAR nuclear reactor at N.C. State and tour ABB's model for integrated smart grid solutions. Food and transportation will be provided. Registration required.